Why is it important for countries with open domestic trade to implement domestic bans on wildlife products like ivory and rhino horn? The 1989 international ivory ban was initially a huge success; it reduced prices drastically, which almost eliminated markets in the United States and Europe. Of course, the impetus behind this decision was the terrible poaching epidemic that took hold more than five decades ago. There was a crisis after the 1970s, when actually Africa suffered most — we halved our population of elephants and lions; rhinos were extinct in a number of countries. The Convention on International Trade in Endangered Species and Wildlife Flora (or CITES) upgraded the African elephant to Appendix I in 1989. Plant and animal species in this category are threatened with extinction and international trade of their specimens is not allowed. This move had a tremendous impact — elephant populations started a slow recovery, but domestic ivory sales continued to be legal in some countries. 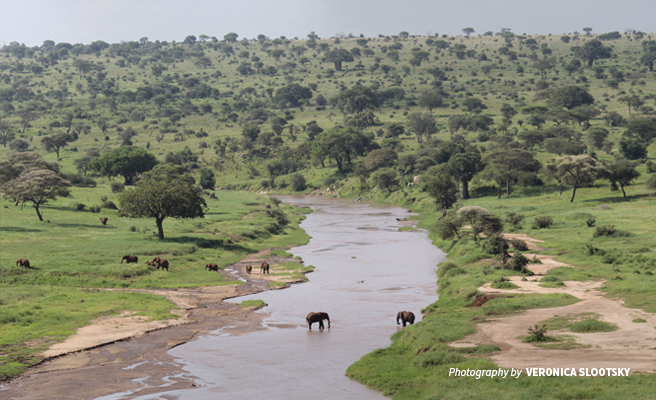 Although many African countries are not yet above the water, their wildlife populations are increasing. These nations have strengthened management of wildlife with stronger laws and very good wildlife management policies across regions. How do legal domestic markets create loopholes for wildlife criminals? An inadvertent result of the international ivory ban in 1989 was the mushrooming of a dense network of smugglers and middlemen trying to launder an illicit product to reach legal domestic markets in a number of high-volume consumer countries like China. Trafficking of illegal wildlife products has since grown into a syndicated operation using the same tactics and networks as other criminal traffickers smuggling arms, narcotics, and other contraband. As we saw when CITES approved one-off sales of stockpiled ivory in 1999 and 2008, the introduction of “legal” ivory into the market revived consumer interest, particularly in China and Japan. This unfortunate move — though intended to raise funds for elephant conservation on the continent — created demand for an illicit product and reignited the poaching crisis. By 2014, Tanzania had lost almost half of its elephant population. China’s closure of its domestic ivory trade in 2018 is a monumental win for African conservation. 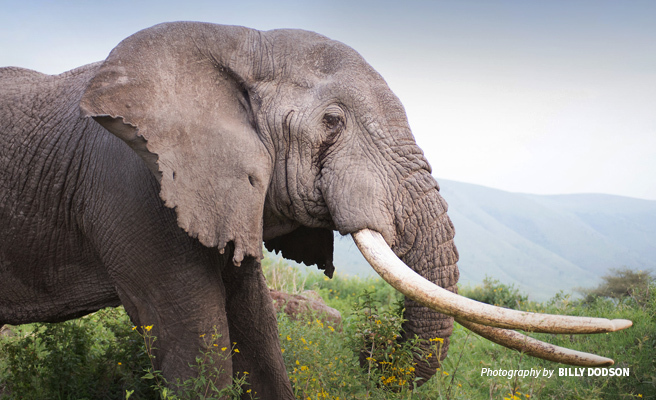 Since the ban was announced, the price of ivory has dropped by more than 60 percent. Recent surveys are showing that some people are rejecting ivory altogether — a promising trend in just one year of the ban. However, stopping ivory trade without international coordination is like squeezing a balloon — if the domestic market of one country closes, it bulges in another consumer country. What would you say in response to someone who asks why non-African countries should care about the demise of Africa’s elephants and rhinos? I believe Africa is the origin of humanity, and so its wildlife is a global heritage worth protecting because we are all Africans. Science points us to a similar interconnectedness — the ecological systems of this continent maintain life on Earth. Take, for example, the forest elephants of the Congo Basin. As weeders, they play a critical role in maintaining the world’s second-largest rainforest — a significant carbon sink responsible for regulating global temperatures known as the planet’s second green lung after the Amazon rainforest. It is so important that the world sees Africa’s wildlife and wild lands as part of a system that maintains the balance on this planet. We also know that Africa is going to be impacted more than any other country by climate change but sadly, most people have grown to understand that the world is where we live. They are yet to understand that by protecting wildlife, like the forest elephants of the Congo Basin, they are securing an ecosystem that ensures the survival of the human species. “If you’re better, I’m better” — this is one of the principles of Ubuntu, the African philosophy of oneness. It is known by different names across the continent, but it embodies the interconnectedness of all life. 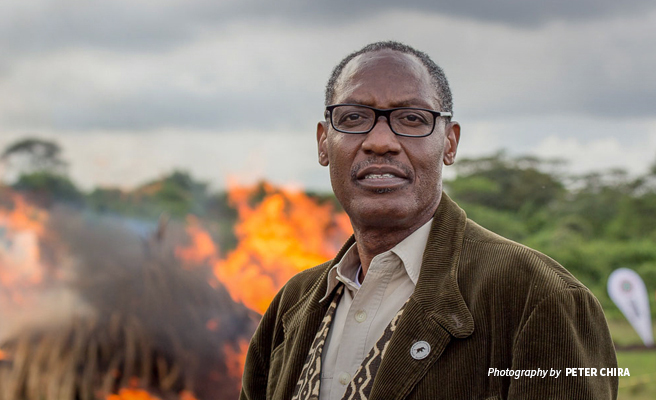 How does the illegal trade of Africa's wildlife threaten the world at large? The world has allowed a system that trades Africa’s wildlife. Apart from driving the loss of our iconic species, the same system peddles drugs, illegal arms, and even human beings. By addressing wildlife trafficking, we are shutting down a lot of illegal trade systems that also depend on poor governance and that thrive in corrupt environments across the globe. This raises the stakes for wildlife protection in Africa, but it does not necessarily make it harder for us to win the fight. Rather, what makes it hard is the fact that few people are aware of the connection between their consumption habits and the wellbeing of the planet. What is the importance of raising awareness in consumer countries and changing mindsets about wildlife products? The killing of Africa’s wildlife happens because of demand for their parts, but I have never heard of an African who is looking for a rhino horn or ivory for their own use. There is no consumption on the continent, so New Zealand, Japan, Europe, and North America need to take on this responsibility. The internationalization of issues means that we must all make choices to protect Africa’s wildlife. However, it is the people of the continent who end up making more difficult decisions that have direct impacts on their incomes and quality of life. It is more difficult to tell a rural farmer in Africa that they can actually manage their river better than it is for a person in the global north to switch off the bulb and save electricity. The UK has just announced a very strict ban on ivory trade, and we have not seen its economy collapse as a result. Speaking as an African, I struggle to see why it is so difficult for countries to make the right decision and close their domestic markets. Africans are making harder decisions when it comes to conservation, but a rhino horn is not something that a wildlife trader in New Zealand or Japan needs to survive. However, the responsibility of Africans is not to wait for consumer countries to ban ivory trade — we need to stop the killing in the continent and stop the trafficking of illegal parts at the source. How do governments prevent corruption and ensure that domestic bans are carried out? Illegal trade of Africa’s wildlife thrives in a corrupt system. It feeds on poor governance of laws, poor custom systems, and weak law enforcement; it thrives on mismanaged borders. Until the world pays attention to the value of Africa’s natural systems, there will always be an economic incentive to exploit wildlife because international trade of Africa’s raw materials has existed for centuries. It is not new because it is happening to wildlife but today Africa is losing biodiversity because of this trade. Since the poaching crisis of the 1970s and 1980s, it has become easier and quicker for someone to purchase ivory — one can legally buy the product online in real time. With a change in commitment, governments can use the interconnectedness to transform mindsets and encourage new behaviors that protect natural systems. Stopping the trade of ivory within their borders is the first step in the right direction. Harleen Sehmi is the Digital Content Officer at African Wildlife Foundation. 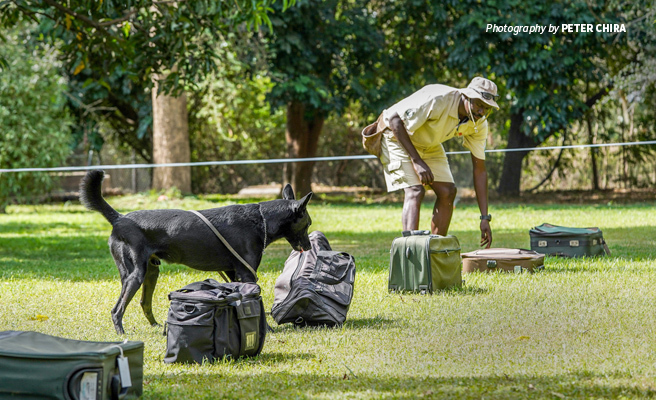 She loves connecting audiences all over the world with AWF's work in diverse landscapes and its impact on communities.